Includes about 45 minutes of meditation and 15 minutes of service. The service includes recitation of various sutras and the chanting of our lineage. This lasts about an hour in total. Please note that our services start promptly and late arrivals may be disruptive to others who are meditating. Please give yourself enough time to get settled and oriented before service starts. Additionally, early arrivals are welcome as there is always help needed with the sacristy and various other tasks to help maintain the service offered by the group. We ask that those wishing to attend a service and meditation attend our Introduction to Meditation orientation before attending one of our services. Transfer of Merit: During service or by request via our email newsletter. Service: Chanting of our lineage and recitation of sutras. Shikantaza: Serene reflection sitting meditation. A Japanese term for Zazen. 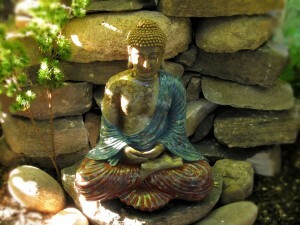 Our practices are typically covered in our Introduction to Meditation class. Retreats, Soto Zen study groups, visits by teachers and visiting monks, group travel to Soto Zen events and retreats, and the observance of various festivals and important dates or practices are announced regularly at services, and broadcast on our email newsletter. Please also watch the Home Page for notices of current or upcoming events.